Settled for another stint of mystery and a pleasant short story introduction to the darkly twisted world of super-sleuth Sherlock Holmes, I opted for The Adventures of Sherlock Holmes as my forceful contribution to our March book club selection. Somewhere I had gotten the idea, from the wonderful world of the internet, that this was Conan Doyle’s first big hit with the Sherlock and Watson duo of adventurous gumshoe characters. The Internet, ever the deceiver, doesn’t back this up . . . or at least Wikipedia claims otherwise. Still, a collection of beloved stories, most of which had originally been serialized in The Stand Magazine, seemed like a good intro and hopefully would persuade my non-mystery-loving book club compatriots to join in my fetish for a well turned clue, creaky houses, and schemes of murder. 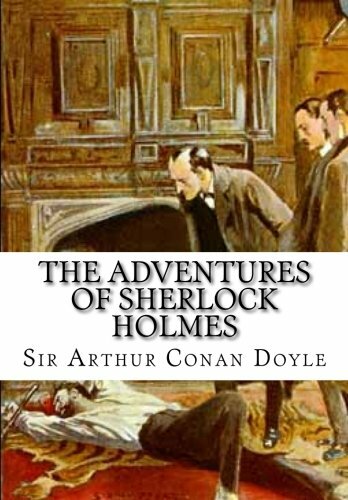 The Adventures of Sherlock Holmes is comprised of 12 short stories arranged with no rhyme or reason. Stories are not in chronological order and indeed, the first story, “A Scandal in Bohemia” casually references previous adventures and established characters as though first time readers were in the know from page one. This confusing stance soon grows as some stories seem farther back in time with Watson as Sherlock’s live-in sidekick only to be rapidly juxtaposed in the next story with Watson as a married doctor, merely visiting. Once readers stop trying to tie the stories together and just accept the jagged timeline and the evidently gaping holes in Sherlock and Watson’s detective history, however, the thematically dark cadence and focused sleuthing soon overshadows the lack of organization. The overarching reaction of my book club, for whom this was the first Sherlock experience, was a surprise at the general seriousness (and sheer depressing nature) of the stories and a suspicious respect for the tropes established by Doyle, so recognizable across our culture and in later mystery tales which spoof (if not downright steal) from the great Sherlock. In the end, my non-mystery loving bunch remained cautions of the genre, but glad they had at least dipped a toe in the deep lake of investigative murk. Some of my favorite stories, and some of the darkest that had my friends shocked at the lack of coziness in the pipe smocking Sherlock’s world, center around historical events, such as the rise of the then little known KKK. In “The Five Orange Pips” Holmes is asked to investigate strange, repetitive deaths in a well to do, yet darkly disingenuous family. Investigation reveals letters and an engraved box, all pointing at a stint in America and involvement in a small but vicious cult. Sherlock brings the horrors of the new world straight to the happy hearths of the English, providing an ending where the price of failure is death. Another favorite story, “The Adventure of the Speckled Band” revolves around a misanthropic family, an inheritance, and a mechanical murder plot that only Sherlock can stop in time. Involving the usual complexity of minute details and cunning betrayal, the story’s darkness is only compounded by the brilliance of the long running scheme and the last minute recklessness that nearly costs Holmes and Watson their lives. Guest stars involve exotic animals, a trained snake, and some suspicious re-architecture of the family mansion. “The Adventure of the Copper Beeches” follows the story of a young governess transported to a strange family under secretive conditions and the requirement that for a substantial sum her long tresses be shorn. Ever curious about the growing weirdness of her environment and the locked off wing, the governess seeks Sherlock’s help in unlocking an unhealthy family secret and a devastating imprisonment. Mahaps you’ll find some attack dogs and axe wielding thrown into the revelation. In “A Case of Identity” an incestuous plot is exploited to gain money and set an inheritance. Through Holmes non-emotional attention to the small details of the case he unravels another chilling family plot and frees a victim – a young girl with a faithful heart. The story takes us through a secret romance, past an engagement, and to the cusp of a marriage fraught with kidnapping, solemn promises, and a rigged coach. Most unique across the entire collection, and possibly even across all of Sherlock’s adventures, is “The Red-Headed League,” a sardonic story about a pawnbroker with fiery red hair who is inducted into an easy job copying the Encyclopedia Britannica simply because of his flaming locks. Lead to believe that a secret league is helping all ginger haired men, the pawnbroker questions that perhaps his fortune is too good to be truly and merely the cover for something that is just as inexplicable as it is sinister. Ever a lover of the bizarre, Holmes takes the case if not for its strangeness then for its crafty humor. The Adventures of Sherlock Holmes boast other stories which I haven’t mentioned, namely: “The Bascombe Valley Mystery,” “The Man with the Twisted Lip,” “The Adventure of the Blue Carbuncle,” “The Adventure of the Engineer’s Thumb,” “The Adventure of the Noble Bachelor,” and “The Adventure of the Beryl Coronet.”. Each story has its own distinct atmosphere while blending together to form the overarching theme of the whole collection: Short, fast paced, tense mysteries with an intricate arc always fulfilled in the determination of one small clue. Holmes represents a moral albeit removed observer, only interested in the mystery and not the human aura, although he does express a little more empathy for his pretty female clientele. Watson and Sherlock don’t grow so much as entertain and each mystery has a sense of somber verve that keeps readers guessing and drawn into this world of backlit London alleys, rushing carriages, and shifting family fortunes. Not quite as encapsulating as Sir Arthur Conan Doyle’s Sherlock novels, The Adventures of Sherlock Holmes is a good sampling of true detective fair and teaches readers about the development of the mystery genre while letting us get our teeth into juicy, scandalous mysteries, often fraught with jewels and death plots.